Firefighters spent the morning trying to evacuate trapped Paradise residents while creating firebreaks within the town and even moving some people to empty parking lots. “In the past few years, just the way fires have moved, firefighters have had to help with evacuations before they can go back in to put out the fire,” said Lynne Tolmachoff, a spokeswoman with the state Department of Forestry and Fire Protection, or Cal Fire. The sudden fire created chaos. "Multiple evacuation centers [for Paradise evacuees] were opened in churches and on fairgrounds in nearby towns." "Thousands of motorists spilled onto local roadways, following recently redesigned evacuation routes intended to make it easier for them to escape. Yet many wound up sitting in gridlock." The fire is burning in areas that are difficult for firefighters to reach. Twitter users are saying smoke from the Camp Fire has reached San Francisco and other Bay Area cities. Photos show the smoke beginning to obscure the Golden Gate Bridge. Good grief. The fire is now covering 18,00 acres; it was 8,000 a couple hours ago. I've just added more updates from the Chico Enterprise-Record report, below. This situation is getting more serious by the minute. From the Sputnik report, resources are spread thin -- "resources" meaning help with evacuations. One problem with evacuation is simply gridlock; vehicles leaving the town are end-to-end. The following photo was taken earlier in the day, and even then traffic was heavy. At least one roadway had to be blocked off because of the fire. Paradise sits in the foothills of the Sierra Nevada mountain range, near the larger town of Chico and about 75 miles north of the state capital of Sacramento. 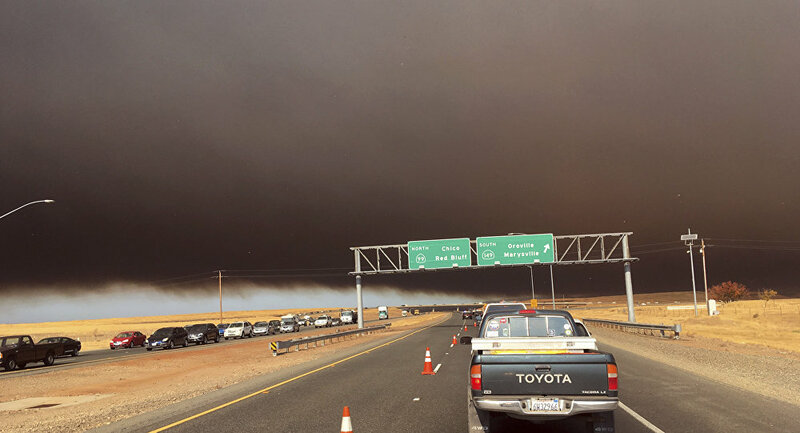 However, on Thursday the place is very far from paradise: a rapidly growing wildfire encompassing 6,000 acres [at last count 8,000 acres] is closing in on the town, forcing its residents to drop everything and evacuate, the San Francisco Chronicle reported. ​Cal Fire, the state's agency responsible for managing the region's chronic wildfires, reported that the blaze has been dubbed the "Camp Fire," a humorously serendipitous name that comes from its place of origin: the area of Camp Creek Road and Pulga Road near Highway 70 in the Feather River Canyon, to the east of town. At least one young resident was confused by the name.